Developed in collaboration with Centro Stile Ferrari, the Hublot Classic Fusion Ferrari GT Watch is as close as you can come to strapping a prancing horse to your wrist. Its 45mm case holds a sapphire dial, which allows for views of the new UNICO HUB1280 movement. Hints of Ferrari's signature red can be seen on the upper pusher and second hand, while the case is rendered in either titanium, 3D carbon, or "king" gold. What a difference a color makes. Subtly shaded from the exterior to the center, the slate grey dial of TUDOR's latest Black Bay Bronze accentuates the model's patinated aesthetic. It's joined by a slate grey bezel, while the hour markers and hands are lume-filled and outlined in gold. An in-house Calibre MT5601 automatic movement offers COSC-certified performance and a 70-hour power reserve. The 43mm case is still made from bronze and water resistant to 200m and is held in place by either a black nubuck leather strap or slate grey fabric strap with bronze buckle. Introduced in the late 1970s, Bulova's all-digital Computron is making a return appearance. The reissue retains the trapezoidal case and angled LED screen of the original while adding a dual time zone function and a month/date/day indicator. It will come in three references, including a gold-plated option with matching bracelet and red display, a black version with a rubber strap and red display, and a stainless model with a matching bracelet and blue display. Created for Pan Am pilots aboard the Boeing 707 who needed to tell time in two different time zones simultaneously, the GMT-Master is a Rolex legend. And while it's still an ideal choice for time-zone hoppers, the diver has come to represent much more. Impeccably maintained examples like this one are becoming harder and harder to find, produced in 1978 with a matte black dial with creamy markers, "Mercedes" hour hand, "lollipop" seconds indicator, date window, red 24-hour hand, and the iconic blue and red bi-directional steel bezel. This model features a case in excellent condition showing light wear from use along with an Oyster bracelet and stamped crown guard. The watch is running at COSC spec, and the original box and paperwork are included. Water resistance is not guaranteed on any vintage timepiece. Made in Italy, the U3 is Unimatic's first chronograph and their latest adventure in minimalist style and compelling functionality. The "Modello Tre" features Unimatic's most comfortable case to date, available in brushed stainless steel, or with a black DLC finish. The case offers a 300-meter depth rating with screw-down pushers and thick double domed anti-reflective sapphire crystal — making the "chrono-diver" as useful underwater as it is on dry land. The dial continues the brand's commitment to stark, highly-legible aesthetics, but adds two sub-dials with gilt-style markings, a 30-minute and 24-hour counter, and thick cream colored indices and matching hands. The U3 is powered by Seiko VK64 Meca-quartz movement that combines the accuracy of quartz with the crisp feel and performance of a mechanical chronograph. Each timepiece comes with both a black Made in Italy Horween leather two-piece strap and a black NATO strap with matching hardware. The U3-A is limited to 600 units, while only 300 of the black DLC version exist. 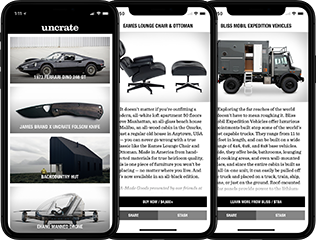 Uncrate is an authorized dealer of Unimatic timepieces, extending their full warranty with purchase. Seiko's 6105 is synonymous with Martin Sheen's character from Apocalyse Now — so much so that it's widely referred to as the "Willard". The new SLA033, otherwise known as the 1970 Diver's Re-Creation, brings this oversized watch back to life. It's powered by a caliber 8L35 automatic movement with a 50-hour power reserve, and its 45mm hard coated stainless steel case is water resistant to 200m. A Zaratsu-polished bezel adds a bit of Grand Seiko-level craftsmanship, and a waffle pattern silicone strap completes the utilitarian look. Limited to just 2,500 examples.